In this tutorial, you’ll learn how to download, install and use YouTube music outside the US. Before going to the procedure, let’s know some details about YouTube music. YouTube is a video portal owned by Google and it the world’s third largest website. In this month, Google has launched a new music streaming service for music lovers. This service is limited to the users who are in the US and enjoy the music like the video and also can save music for offline use. This app seems and works like a music player where you can search and play your favorite songs by the name of the song, artist, or album. If your are outside of the US, then you can’t download and use this music streaming app. But, don’t worry my friends, today I am going to show you how you can use YouTube music outside the US. Both rooted and not rooted users can take its benefits. Just follow the below steps. If you are outside the US, then this app will not be available on Google play store to download. You can follow an outside source to download this app. Choose APKMirror website to download YouTube Music apk on your phone. To install this app, you need to enable the “Unknown source” option. You can enable it by going your phone’s Settings >> Security and enable it. 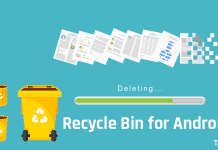 Now you can able to any APK file download outside the play store. After installed the app, open it. When you open it for the first time it requires Sign In into your Google to in order to play music. But, in your case you can’t log in because you are outside of the US. You’ll get an error that, “Music streaming isn’t available yet in this country, but you can always download use the YouTube app.“. Follow the next step to proceed further. Now you need to fool YouTube music app in order to use it. You can easily change your region by using a VPN app. There are a lot of VPN apps are available in the Google play store, but in my opinion Psiphon is the best because it is available as a free download without any data limit. It is also available in Pro version without any ads and the amazing this is that it is also free. Follow the below link to download and install Psiphon on your Android device. 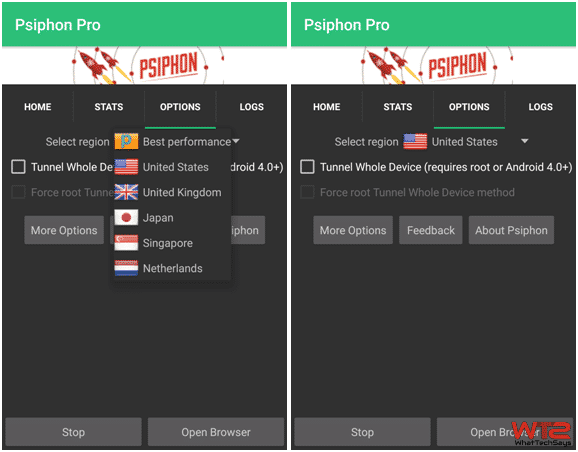 [appbox googleplay appid com.psiphon3] Once you open it, it started connecting to the VPN server. On the “Options” tab, you can change your region to “United Stated“. The “Best Performance” option also works as well. Now all the connection of your phone will be bypassed to the US and in this way you can fool the YouTube music app. 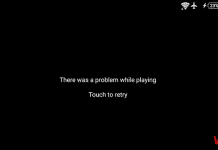 Now the time to launch the YouTube Music App and wait for it to load. If everything went smoothly, you will see the YouTube Music Interface. 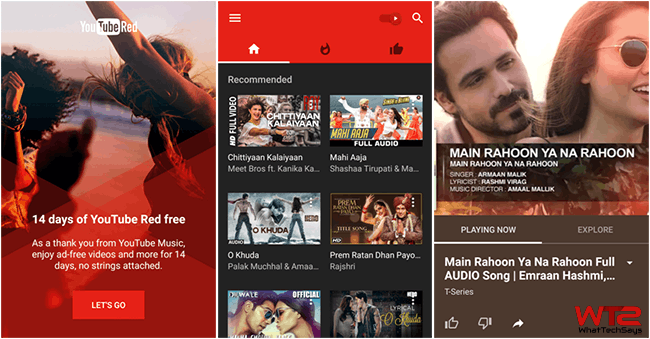 When you tap on Sign in button on the app, you will get a 14 days free trial of the YouTube Red that enhances the YouTube Music experience. Now you can enjoy 14 days of free music as well as video in both YouTube video and music app. 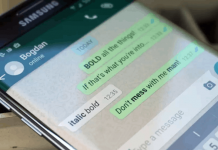 But, you will need to have Psiphon running in the background all the time while you are listening to YouTube music and don’t worry about it, it is a free VPN service. 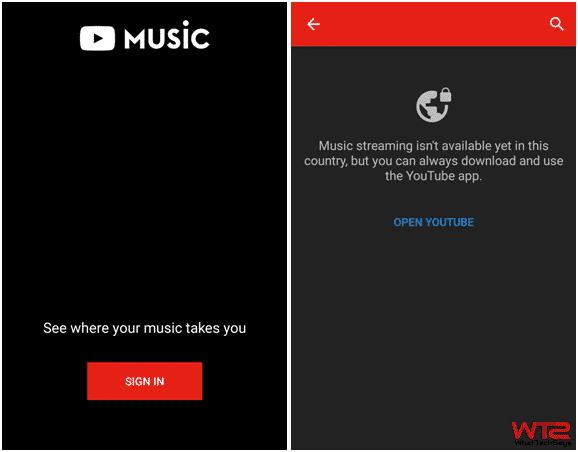 In this way, you can download, install and use YouTube music outside the US on your Android phone. Go ahead and enjoy your favorite music in the background while working. If you are facing any issue regarding this, then feel free to comment below, I’ll try to solve it.